Dating can be difficult: no matter how great your chemistry, one scroll of the iPod might reveal that My Chemical Romance can only end in Megadeth. 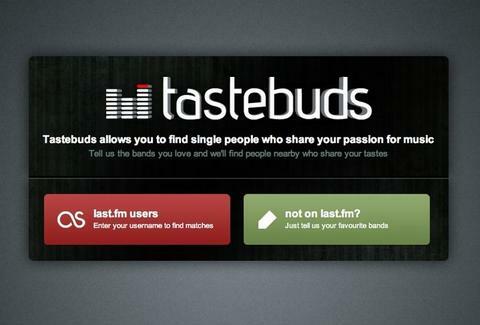 Making sure you find your sonic match, Tastebuds.fm. Just launched, Buds is a globally rigged dating site that goes beyond the usual pics and "I like the beach"-info by focusing on bringing people together via their favorite bands; it was hatched by two UK bandmates who realized how important music is to compatibility after their own online dating attempts...lacked a certain...harmony. To hunt for potential mates, either give the site access to your LastFm profile and its vast array of aural info, or simply punch in band names; the more matches the better, as the site truly does host some uniquely inclined ladies, e.g., Elvis and Slayer, or Bob Dylan and Bloc Party, or even Kings of Leon and Casiotone for the Painfully Alone, a band this service was designed to make painfully unpopular. To find out even more about potentially perfect partners, check to see if they've added a YouTube link to their profile, meant to highlight a particular song/video they're super into, or a gig they actually attended; you can also narrow your search by location and age, just to make sure this music-lover you're so cosmically aligned with isn't actually Bob Dylan. One outlying feature on the site: "custom artist", which essentially allows you to search for bands you're curious to see who's into, but aren't ready to add to your profile -- because as we all know, sometimes the hottest girls like the worst tunes, which is why you must keep up your search for all the Single Ladies.